This 2004 INFINITI QX56 is proudly offered by Okaz Motors This 2004 INFINITI QX56 comes with a CARFAX Buyback Guarantee, which means you can buy with certainty. 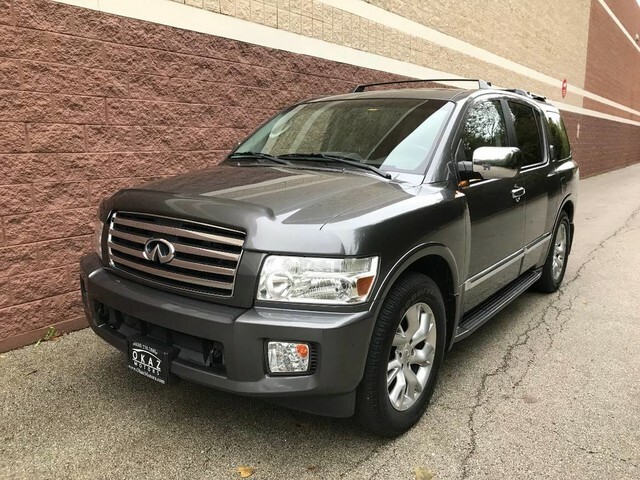 This is a well kept ONE-OWNER INFINITI QX56 with a full CARFAX history report. In their original incarnation, SUVs were chiefly owned by folks who valued utility above sport. Not anymore! The INFINITI QX56 redefines the SUV and makes the perfect all around family companion. There's a level of quality and refinement in this INFINITI QX56 that you won't find in your average vehicle. Once you see this INFINITI, you'll quickly see that this is the perfect vehicle for the outdoor junky! You'll even feel relaxed knowing that this All-Wheel drive vehicle will get you to where you are going no matter what may come your way. Also, with this INFINITI QX56's dependable control you'll be able to drive into the sunset without a care in the world! You can tell this 2004 INFINITI QX56 has been pampered by the fact that it has less than 95,807mi and appears with a showroom shine. Added comfort with contemporary style is the leather interior to heighten the quality and craftsmanship for the INFINITI QX56 You can take the guesswork out of searching for your destination with this INFINITI QX56 's installed Navigation system. Know exactly what you're getting when you take home this INFINITI QX56 as past service records are included. Rare is the vehicle that has been driven so gently and maintained so meticulously as this pre-owned beauty. This highly refined INFINITI QX56 comes with exciting features you'd expect in a vehicle twice the price. High-performance tires are another option found on this vehicle.